Seniors Garrett Dickerson and Warren Long stand in the end zone. Dickerson caught a pair of touchdowns in NU's dominant win over Minnesota. Gale-force winds and a wintry mix couldn’t slow down Northwestern. Instead, the No. 23 Wildcats (8-3, 6-2 Big Ten) thrived in the miserable slop that kept many fans away from Ryan Field, dispatching hapless Minnesota (5-6, 2-6) on Saturday 39-0 to win their sixth straight game and close the home slate on a high note. 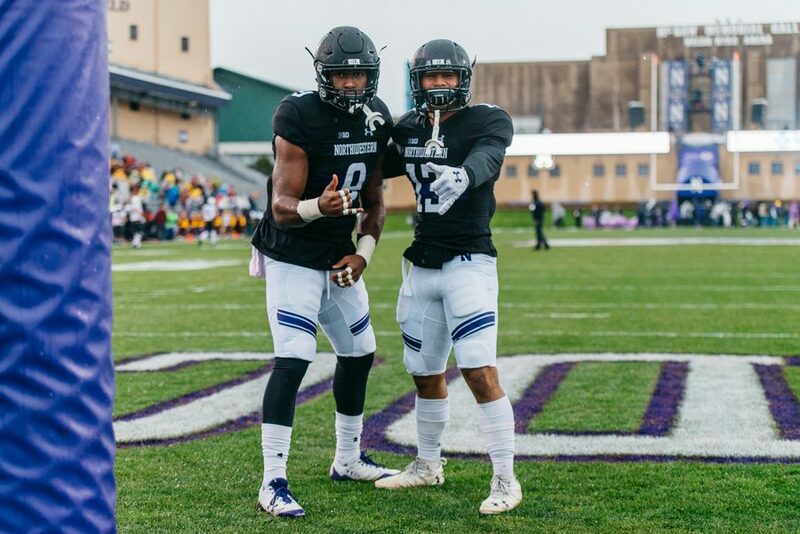 Senior running back Justin Jackson tallied 166 yards on the ground, junior quarterback Clayton Thorson managed three touchdown passes and the NU defense forced five turnovers in a shutout effort. The Cats did much of their damage in the second quarter, piling up four touchdowns in the period to take a 25-0 lead into the break. NU then added on scores in the third and fourth periods with primarily reserves in the game to close out the win. 1. The weather dictated the day. Throwing the ball was a near-impossibility, as balls died in the air and several receivers saw passes slip through their hands. Minnesota quarterback Demry Croft completed just two passes, and Thorson was limited to 9-of-13 himself. Punts sunk in the wind, giving the Cats excellent field position on several second-quarter drives. 2. NU’s rushing attack was in full swing. Jackson carved up the Golden Gophers’ defense left and right to the tune of 31 carries, powering a Cats offense that mostly stuck to the ground. He also reached two significant milestones: topping 1,000 yards for the fourth consecutive season and surpassing 5,000 for his career. The production extended beyond Jackson, as the backup rushers totaled 98 yards and junior receiver Jelani Roberts scored a touchdown on a jet sweep. 3. On Senior Day, the Cats’ seniors had big days. NU’s seniors were honored individually before the game, and several then closed their careers at Ryan Field in style. Safety Kyle Queiro intercepted Croft to set up the Cats’ third quarter score, superback Garrett Dickerson had two touchdowns himself — on his only two catches — and safety Godwin Igwebuike had two pass breakups. Further down the depth chart, running back Corey Acker scored a fourth-quarter score on his first carry of the season and backup quarterback Matt Alviti played much of the second half.